Yesterday, I reported that Chris Hemsworth had landed the role of Thor in Marvel's latest comic book adaptation to film and now today, his evil brother Loki has been casted! Early on in May Schofizzy brought you a report on some of the rumors for "Green Lantern" and "Thor", well it seems I wasn't too far off. Nikke Finke of Deadline Hollywood Daily broke the story today that Tom Hiddleston has been announced as Thor's evil brother and nemesis, Loki! Tom Hiddleston, like Chris Hemsworth is a relative unknown here in the U.S., however he is a award winning actor in England. Hiddleston recently worked with Kenneth Branagh on a British TV movie series called Wallander, a show that Branagh also directed. Having never seen Hiddleston act in anything, I am leaving all of my confidence in Branagh, who I have nothing but admiration for. I suspect Branagh is going to be creating one helluva masterpiece in "Thor" and having a cast of established but relative unknowns starring, is a nice change of pace. If your worried that Hiddleston looks a little wimpy, don't be! Loki was small in stature in comparison to his older half-brother Thor. Loki was found by Odin as a boy, Odin had killed Loki's father (a Frost Giant) and took Loki raising him as his son alongside Thor. In his younger years Loki was belittled because of his smaller stature and lack of physical abilities, especially when compared to his half-brother Thor. Loki despite his size still has superhuman levels of stamina, strength, durability and immunity. Loki also focuses his gifts on scorcery, something in which he can command with amazing ability. 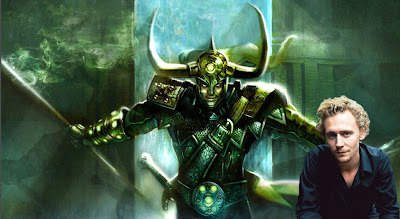 Loki is dubbed the God of Lies and Mischief due to his uncanny ability to manipulate reality. Loki is driven by a lust for power and a hatred for Thor and it should be real fun seeing Kenneth Branagh at the helm of this story!